The human body is made up out of trillions of cells (cell size illustrated in a movie). All of these cells have their own tasks to keep the body functioning correctly. This means that some cells are being renewed every couple of days, and others stay where they are for years. Despite the fact that cells from different organ systems can have very different tasks, they all have the same 3 billion deoxyribonucleic acid (DNA) base pairs. Although the DNA of each cell contains the same information, they can use different control mechanisms to prevent and repair damage. Damage to the DNA occurs thousands of times per cell per day due to endogenous and exogenous DNA-damaging factors or during cell division (1). Even though the cellular DNA repair system is very accurate (DNA repair explained in a movie), throughout a person’s lifetime most cells will acquire changes somewhere in their DNA. Through these changes it can happen that one of these cells manages to acquire the properties to escape all control mechanisms to become a cancer cell: a cell that does not stop dividing and can grow into other tissues. 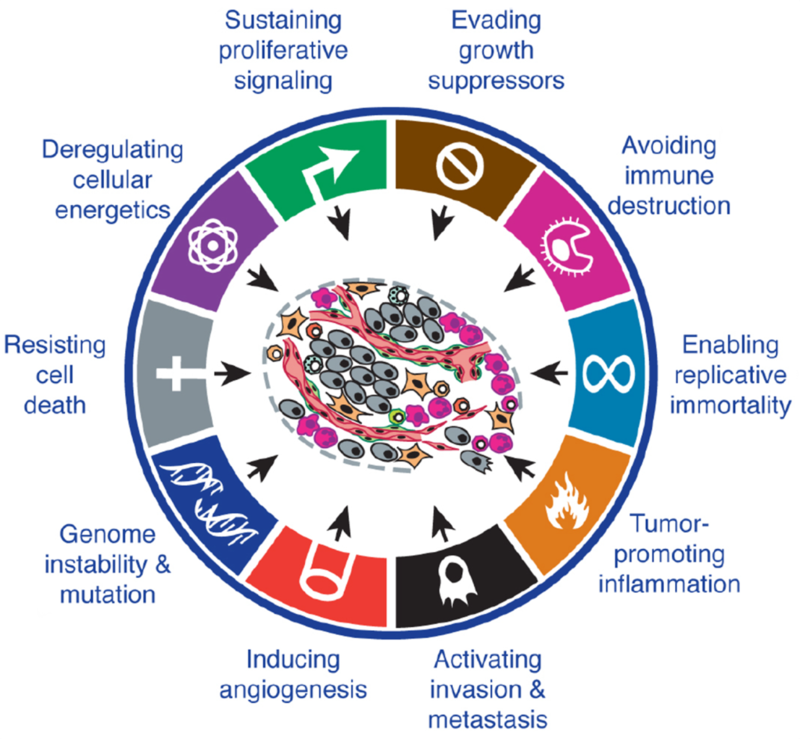 To become a tumor, cells need to acquire characteristics that enable them to keep proliferating and invading, without being stopped by signaling in or outside the cell as summarized in the hallmarks of cancer by Hanahan and Weinberg (2, 3). The fact that they have updated their review to add more (emerging) hallmarks between 2000 and 2011 (figure 1.1), only shows that we are still in the process of increasing our understanding of how a cancer cell becomes (and stays) a cancer cell. Figure 1.1: (Emerging) hallmarks of cancer, adapted from Hanahan and Weinberg 2011 (2),with permission, © 2011 Elsevier Inc. Published by Elsevier Inc.